No lack of excitement at the venue! 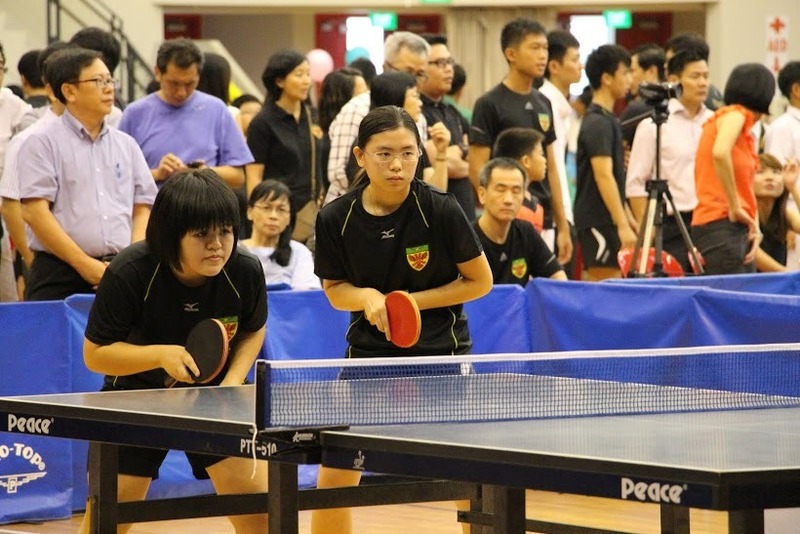 On the 21st of April, for the first time in history, the Raffles table tennis players achieved a clean sweep in their finals, securing Gold medals for all 6 categories. Despite the fierce competition from powerhouse and traditional rival Hwa Chong Institution, the A division players persevered to win 3-0 in the boys’ category and 3-2 in the girls’ category. In both the Boys’ and Girls’ Divisions, teams play up to 5 matches against each other, and the team which wins 3 matches out of 5 emerges victorious. These 5 matches played are: 1st singles, 1st doubles, 2nd singles, 2nd doubles and 3rd singles. In each match, players play to the best of 5 sets, meaning that the first player/pair to win 3 sets wins. In each set, players/pairs have to win 11 points to win the set, but minimally by a 2 point difference. That means, players cannot win a set 11-10; when the score reaches 10-10, players play to 12, and when it reaches 11-11, they play till 13 and so on. The championships opened with a match between Liu Tian and his competitor, who both exuded skill and an ardent resolve. Although the first set was won by Raffles with a score of 11-3, the Hwa Chong competitor did not let this faze him and fought back valiantly in the next set, winning it 4-11. However, Liu Tian regained his composure, and secured victory in the following set 11-9. In the last, and most exciting set between Liu Tian and his opponent, both fervently pitted themselves against the other, and the match score quickly equalised at 4-4. Both players went neck-to-neck; whenever one player seemed to be gaining on the other, the other player would make a return and equalise the score. The pressure mounted – both players refused to yield in the heat of their back-and-forth exchange. However, in the last few seconds, Liu Tian scored a point and secured a 2-point edge, winning the 4th set with a score of 12-10, bringing a first win for Raffles. Following Liu Tian’s valiant efforts, it was time for the boys’ duo, Daryl Tan and Heng Kai, to take over. They got off to a good start, winning the first set for Raffles 12-10. However, they conceded the next set to Hwa Chong with a score of 3-11. Luckily, Daryl and Heng Kai quickly found their momentum, combining skilful defense with calculated aggressive play to easily win the third set 11-6, and race to a quick 7-1 lead in the fourth set. Some uncharacteristic errors from the Hwa Chong side brought us to match point at 10-3, but we suddenly seemed to face some difficulty closing the match. Nevertheless, even while our competitor’s moral was slowly rising, our resolve remained: the pair called for a timeout to regroup and focus, and after a short chat with their coach, Daryl and Heng Kai finally managed to decisively secure the match on the next point, winning 11-8 in the fourth set. The power duo, Daryl and Heng Kai. 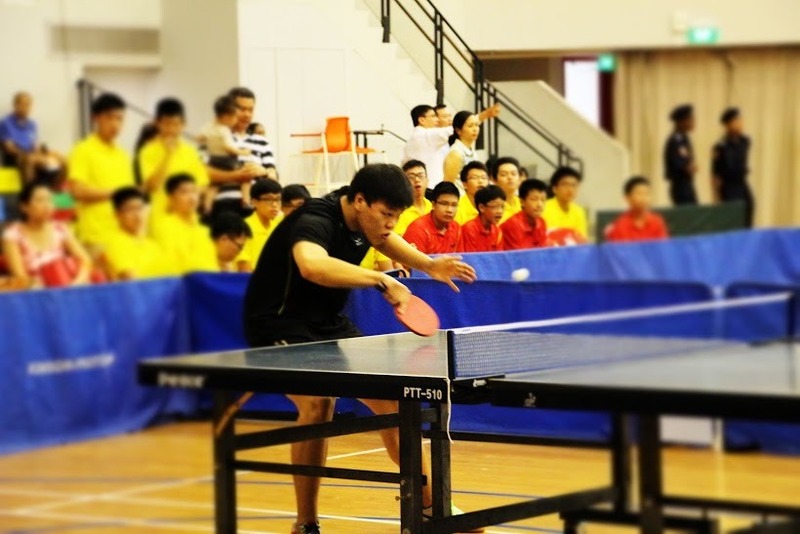 With Raffles comfortably up 2-0, it was up to Yin Jing Yuan to win a third match against Hwa Chong Institution and secure victory – which he did in a convincing fashion. Winning the first set 11-5, Jing Yuan continued his momentum to sweep the next two sets, 11-2 and 11-4. With that, Jing Yuan won the overall 2nd Singles round, helping the A Boys conclusively clinched the title with a score of 3-0 over Hwa Chong Institution. While the boys may have had a relatively fuss-free course on the way to their title, the girls did not quite have a similar walk in the park. Those who had thought that they were on course for an effortless victory were sorely mistaken; the Hwa Chong contingent, backed up by an enthusiastic bunch of supporters, refused to back down. 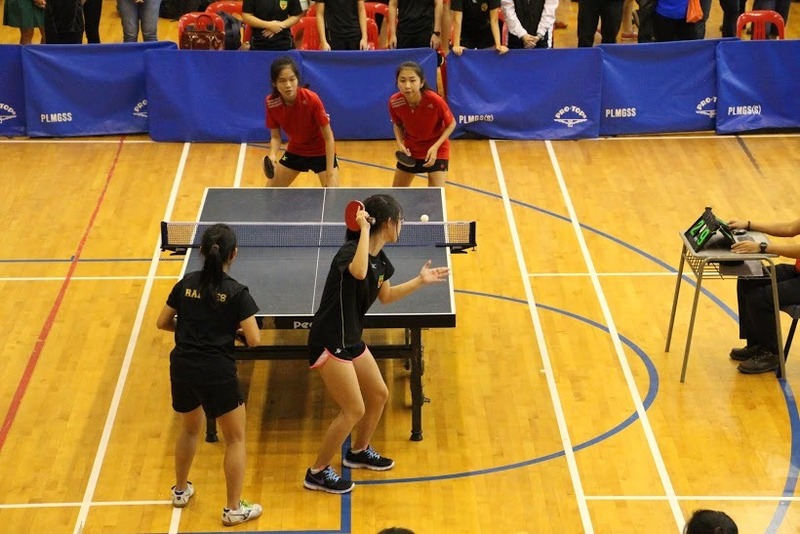 There was a sense of suspense and tension evident even from the opening match, played by Melissa Tan against her Hwa Chong contender, which was rife with passion and competition. Despite losing the first set, she eventually rallied to win her overall match 3-1. Melissa Tan – a steadfast player. This triumph set a precedent for the next match, the girls’ first doubles, in which Charlene Koh and Liao Fang won 3-0 with ease, sweeping aside their Hwa Chong opponents who never won more than 5 points in each set, putting Raffles up 2-0. Charlene Koh and Liao Fang, playing together for their doubles match. The 2nd singles match which followed was arguably the most emotionally charged of the afternoon, pitting Li Jiaxin against a feisty Hwa Chong opponent. The two players were noticeably aggressive from the get-go, trading the first 2 sets evenly. More spectators began to gravitate towards their table to catch a glimpse of the enthralling encounter. Li Jiaxin just after sending a good serve. Jiaxin’s opponent stepped up a notch in the 3rd set, pulling off a series of aggressive plays and shots that pulled Jiaxin from side to side, which helped her take the set comfortably with a score of 11-4. In the 4th set, Jiaxin started out strong, racing off to a 4-0 lead. However, her opponent struck back by winning several tight, extended rallies which had the crowd leaning on the edge of their seats. With the score tied at 8-8, tensions ran high – both players were furiously pumping their fists after each point. Yet, despite a valiant fight, Jiaxin eventually lost 11-9. However, she never gave up and fought fervently throughout the match against an equally-spirited opponent in a laudable show of her persevering attitude. The score thereafter was now 2-1, in favour of Raffles. Was Hwa Chong mounting a comeback? The next match involving Cheryl Tang and Tan Qi was similarly fiery, consisting of many long rallies and constant switch-ups in style, with the girls on both sides rapidly switching between offense and cautious defensive play that ensured the match never lost its entertainment value. Every time one team appeared to have gained momentum, the situation soon swung back dramatically in the opposite direction, resulting in a battle that was neck-and-neck throughout almost 45 minutes. However, despite a spirited fight, the Raffles pairing lost in 5 close sets (5-11, 12-10, 5-11, 11-7, 7-11). With both schools tied at 2 wins each, victory boiled down to the result of the final singles match which fielded Xue Qi, who was Captain of the girls’ team. 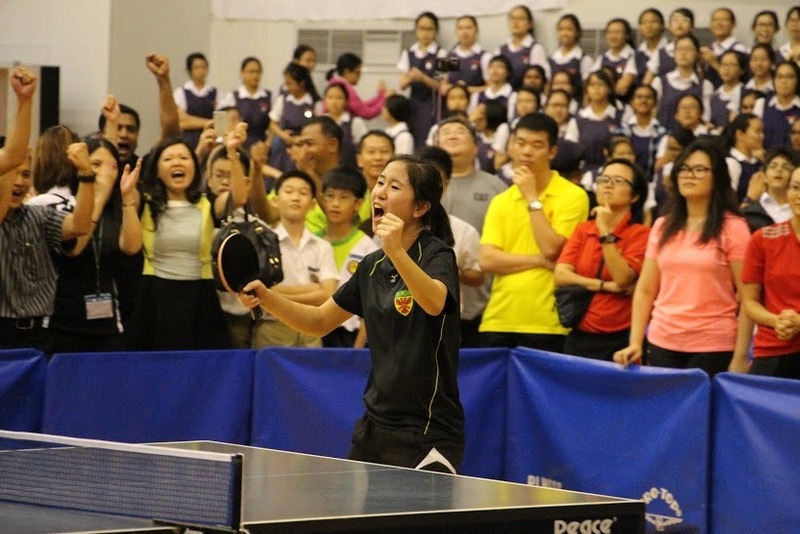 Faced with the arduous task of bearing the pressure of defending the school’s A Girls title on her shoulders, one would have expected Xue Qi to crumble under the pressure. She was momentarily fazed at the beginning of the match, where some concessions caused Xue Qi to fall behind 3-7 in the first set. However, admirably, she soon composed herself and fought back with a series of well-crafted manoeuvres to tie the score at 7-7. The next few points were nail-bitingly close; however, a couple more errors resulted in the Hwa Chong player claiming first blood, winning the first set 12-10. Ng Xue Qi just after winning a set in the 3rd Singles round. The next set was a case of deja vu, and Xue Qi was behind 1-4. Still, she never gave up and persisted in levelling the score. Then came a crucial point midway; at 8-10, the Hwa Chong player had 2 set points to win the match, a lead that she seemed likely to gain. However, Xueqi maintained her composure and played the next 4 points brilliantly, staging a dramatic comeback to take the second set 12-10. While the momentum may have clearly been on Hwa Chong’s side, it was clear after the end of the second set that Xueqi had gained confidence whereas the morale of the Hwa Chong contingent took a slight blow, becoming more subdued. With newfound confidence, Xueqi easily took the 3rd set 11-5, putting Raffles one set away from a complete sweep of titles. The final set appeared incredibly one-sided in favour of Xue Qi as her constant aggression persistently troubled her opponent, helping her gain an 8-3 lead. With victory on the horizon, the Raffles supporters erupted into a frenzy, almost tasting victory on their lips. Yet, the Hwa Chong player refused to give in, fighting back in an unbelievable fashion to claim the next 5 points, thereby levelling the set at 8-8. This evidently shook Xue Qi as well as many of the Raffles supporters who thought Xue Qi might have been experiencing a ‘choke’, which is a situation where a player lets a position of clear advantage slip from his/her grasp. However, Xue Qi was able to regroup during a short time-out, after which she claimed 3 consecutive points to close the enthralling match in style. The cheers became even more memorable with our RI and RGS counterparts joining us in supporting Xue Qi in the relentless back-and-forth volleys. As soon as her opponent’s final shot sailed long, Xue Qi’s teammates burst from their spectating spots to entrap her in a warm group-hug. Tears flowed and cries of joy erupted from the girls, and many of the spectators could not help but feel pride for them. 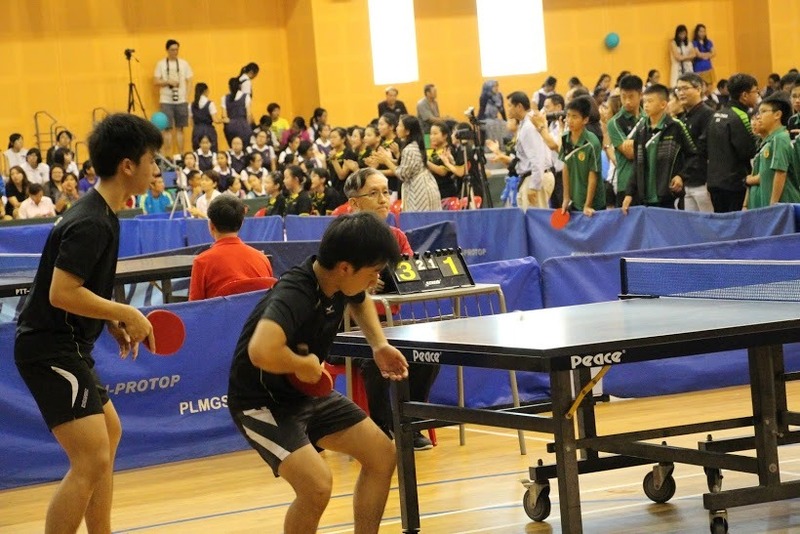 With that, Raffles Institution successfully completed a clean sweep of the A Division, B Division and C Division titles, a feat which had not been accomplished by them in recent times. 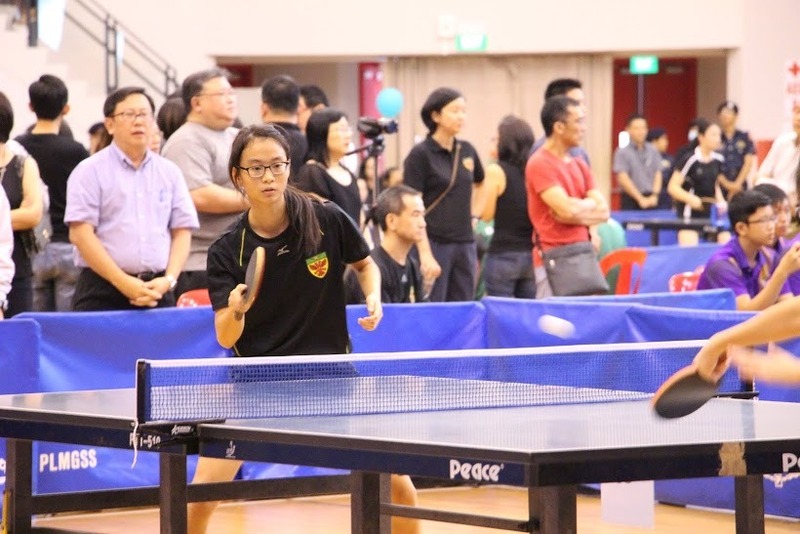 Throughout the course of the afternoon, the volume in the Pasir Ris Indoor Sports Hall had noticeably amped up with the tension, with the hall resounding all around with the sound of spectators cheering their hearts out for their team. 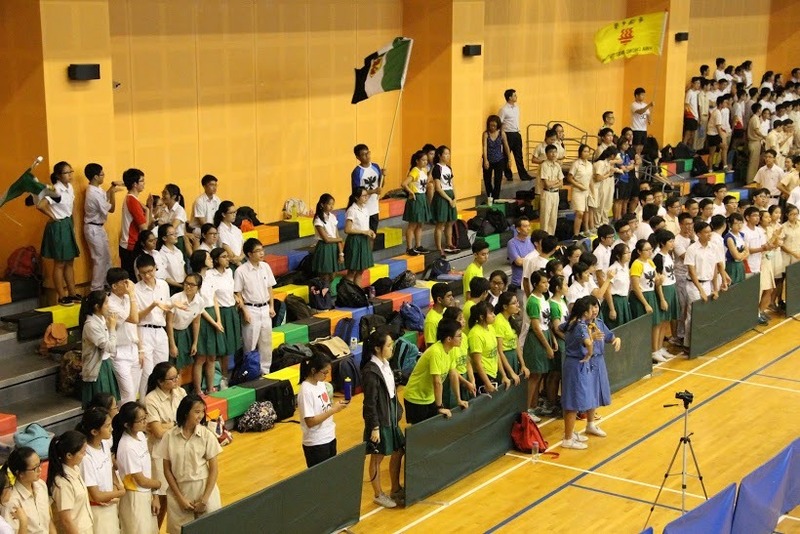 Spectators from the 4 school bodies – Raffles Institution, Raffles Girls’ Secondary School, Hwa Chong Institution and Nanyang Girls’ High School – were collectively cheering their loudest for their schoolmates; there was a veritable cacophony when the two schools attempted to drown each other out. 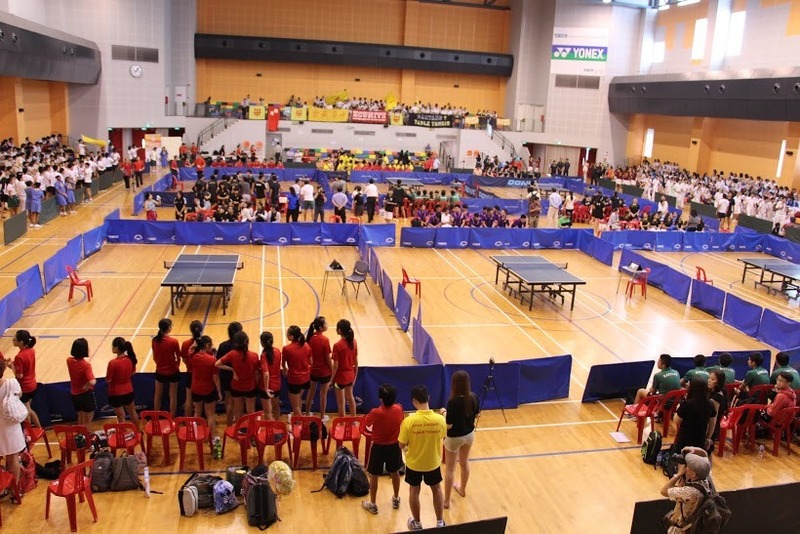 In all, the spirit displayed by all students as they enthusiastically spurred their fellow schoolmates in the arena, from both the Raffles and Hwa Chong side, was commendable. Many Rafflesians left their seats to crowd as close as they could to the fray, to shout words of encouragement to the competitors. 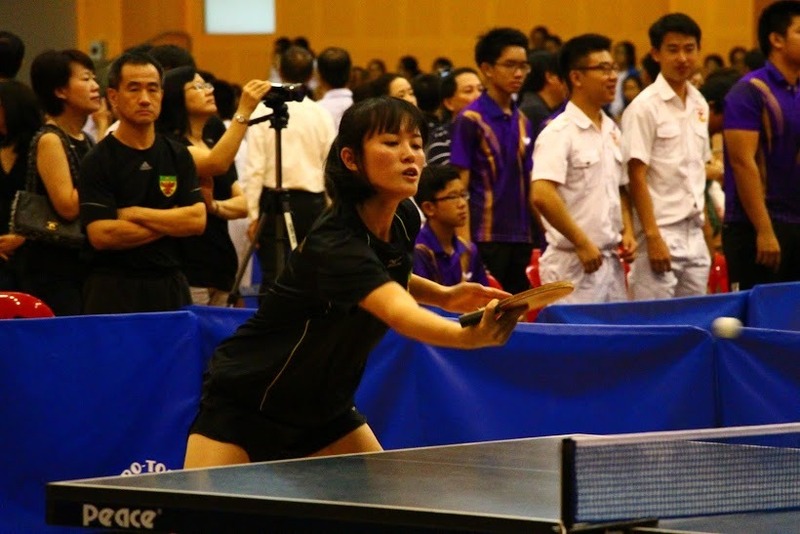 Winning 6 titles was definitely not easy, as Li Jiaxin maintained: “The opponents we played against were formidable for all the 6 teams – but still, we’re glad that our dream came true.” Indeed the atmosphere in the Centre felt surreal after news broke of Raffles’s victory, but the tears of joy and heartfelt hugs shared between members of the Table Tennis team were real, a mark of a team who had given their all, and for it, emerged ever stronger and ready for the road ahead in the future.